I’m so excited to share this news with you today! As I’ve been hinting at for a few months, I’ve been spending most of my time lately working on a new venture, Plant-Based Juniors. As most of you know, I become a mom last year to my Vander and to say it’s changed my world wold be the understatement of the year. Motherhood has changed everything, mostly for the better. One thing that’s been center focus is how I will raise him. My husband BL and I are long-time vegetarians, so naturally we plan on raising Vander the same way. And while I feel very confident that this eating pattern is best to promote health and longevity for BL and I, I was a little nervous when it came to my sweet boy. Children’s nutrient needs are different than ours. They don’t just need smaller portions of the food we eat; there are specific nutrients that must be met and frankly, some of those are harder to do with a mostly plant-based diet. It’s why I teamed up with my friend and fellow dietitian, Whitney English, to create Plant-Based Juniors– an evidence-based resource for parents looking to raise plant-based babies. 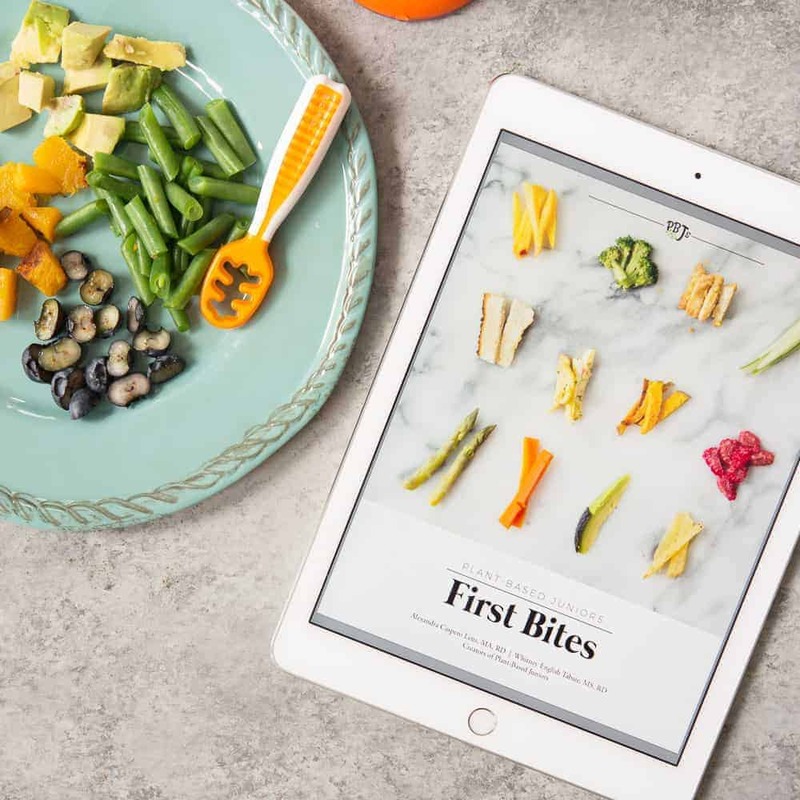 We know how hard it is to find trustworthy information online, so we’re here to ease parent’s fears and empower them to raise happy, healthy children in whatever way that works best for their family — vegan, vegetarian, reducetarian, whatever! That’s the beauty of plant-based juniors. We focus on nutrition, not dogma. All our welcome under the PBJs umbrella, we just want our kids to eat more plant-based foods and guide parents in doing so. 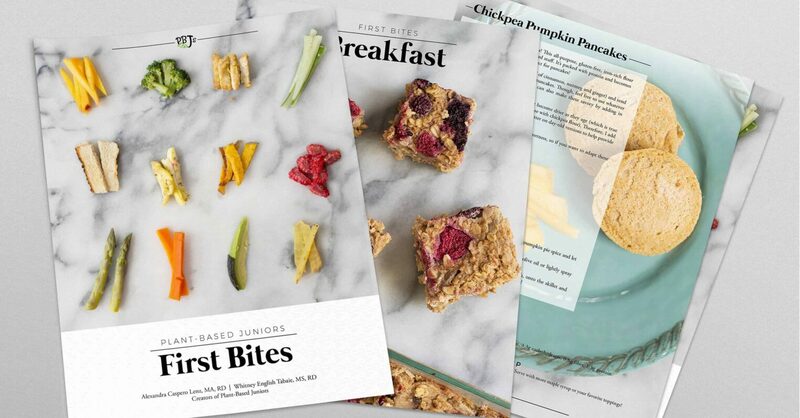 To kick things off, we’re releasing our very first resource — Plant-Based Juniors: First Bites. 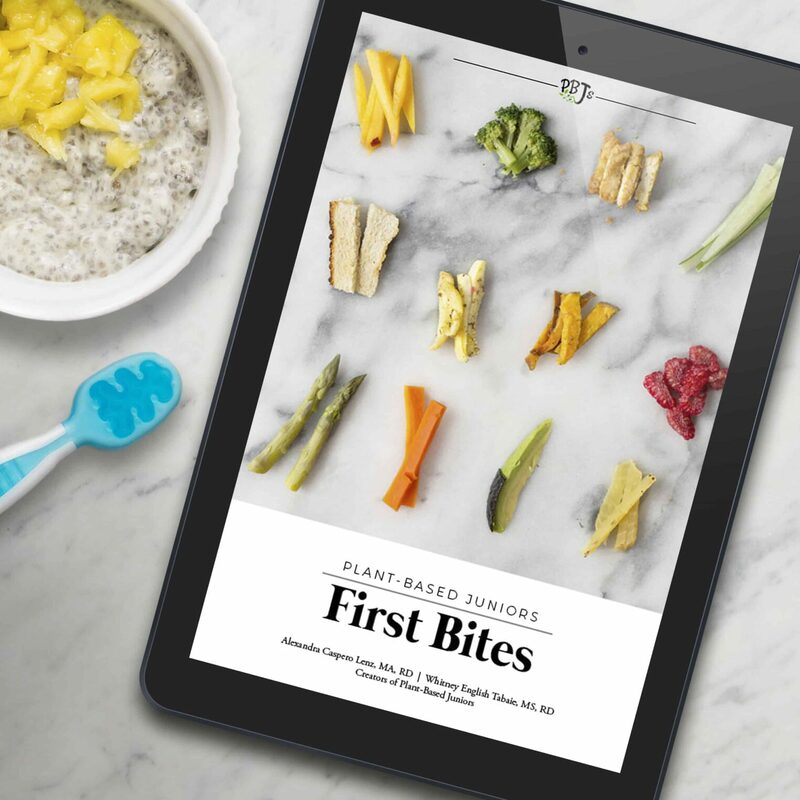 This 42-page ebook is the first of its kind: a definitive guide to baby-led weaning for plant-based babes. In case you’re unfamiliar with the term, baby-led weaning (BLW) is an approach to starting solid foods that allows baby to lead the way as opposed to starting with purees. Emerging research suggests that BLW helps babies form a more positive relationship with food and establish a healthier body weight than the traditional introduction to solids. Why did we choose BLW for our Plant-Based Juniors (PBJs)? To get more information about the book, visit our new website. And use the code “pbjwelcome” to get 10% off! Can’t wait to read through the e book, just bought it! 🙂 We’re having baby girl in November and I definitely want to try baby lead weaning with her. Thanks Emily! Can’t wait to hear what you think! I’m so excited about this! I just started my 6 month old on purees since she’s not showing signs of being ready for finger food quite yet. In a couple weeks I plan to start BLW but am a little intimidated about where to begin. I eat a mostly plant based diet as well so this book will be super helpful! It’s such a fun experience! Yes, I think you’ll love this book then. Can’t wait to hear what you think! This is awesome! Can’t wait to hear more about it. Hello! I have your PBJ BLW guide and it is going pretty good so far! I was hoping you could advise on how long you steam certain things. I feel like it has been a lot of trial/error and waste. I either make it WAY too mushy and it just disintegrates in her hand, or its too hard and I am scared to give it to her. It would make sense just to meet it in the middle, but it ends up not working out. Thanks!!!! Hi Erica- have you tried steam roasting? That’s what I do for Van. So, toss whatever vegetable you are using with oil and spices, then place in a baking pan and cover with a silpat or foil/parchment paper, then cook until the vegetables are tender, but not overcooked. This varies depending on the vegetable, but I use a fork to determine softness. If a fork can easily put in, then it’s done. Vegetables can continue to cook after removing, so error on more raw as you start to figure out the perfect texture for kids.